NJSI has opted to help the Nepal Government in building shelters for about 100 families in Gyalthum. Gyalthum is an area including 4 or 5 village clusters in the ward no. 1 of Mahankal VDC in Sindhupalchowk district. NJSI has been at the village to do the final verification of the enrolled earthquake damaged families and to create the data base which will be given to the bank for depositing the cash in the beneficiaries account. About 70% of the beneficiaries are verified and are in the final list of NJSI-supported shelter project in Gyalthum. The ward has 240 families affected by earthquake. 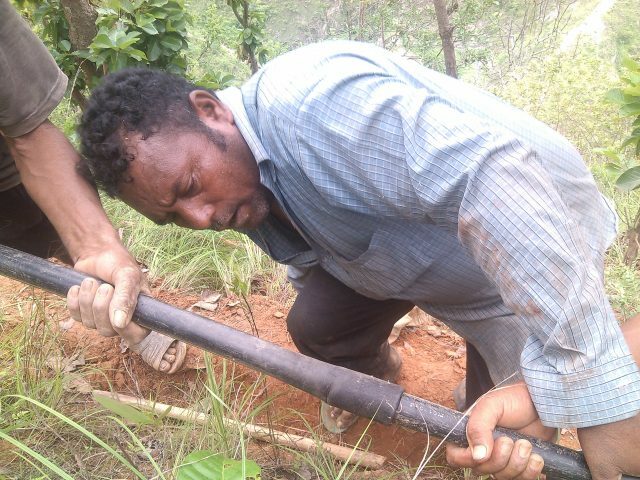 NJSI has started a project of putting 5 km drinking water pipeline for the Chapadi village in Ramechap district. This is one of the worst drought affected areas of Ramechap. The project will give benefit to 34 households and a primary school catering to 67 children. The people have been collaborating with their labour for putting the pipe. More than half of the distance is already covered the rest is waiting for the harvesting to be over since the pipe line has to go through some cultivated land. 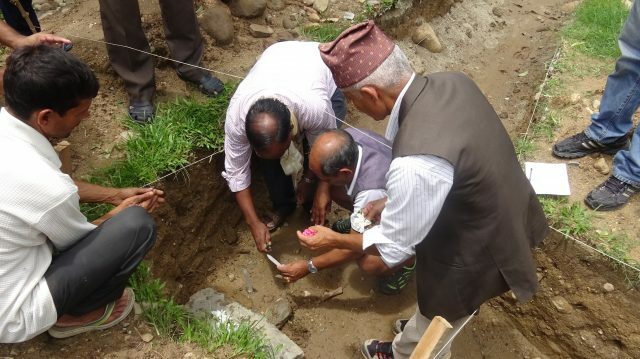 NJSI has started the construction of the three hostels for the special children in Nuwakot districts. The foundation stones were laid in all the three schools namely; Shree Chandeshwari Higher Secondary School (Tupche VDC), Shree Bageshwari Higher Secondary School (Bageshwari VDC), Bhairavi Higher Secondary School (Bidur Metropolitan). Fr. Boniface Tigga, SJ, Superior of the Nepal Jesuit Society was the chief guest who along with the School Management Committee chairmen and other dignitaries laid the foundation stones for these hostels. Among the NJSI team present were Mr. Tika Ram Regmi (the sub engineer), Sr. Manisha (communication officer), Fr. Joseph Pulickal, SJ (Financial Manager), Fr. Roy Sebastian, SJ (Director NJSI). The local people expressed their gratitude and hope while extending their support for the completion of the Support. The project is being funded by Franciscan Missionaries, Germany (MZF) along with Xavier Network.